On the 10th of November Year 12 and Year 13 Law students took part in the Bar Mock Trial competition in Ipswich Crown Court run by the Citizenship Foundation. The team started preparing for the competition in the first few weeks of September and attended weekly sessions on Tuesday after school and on a Wednesday afternoon for 2 hours. Mr Rogers and Mrs Flanigan led the sessions however we also got feedback from Danielle Wright an ex student who is now a Solicitor and Allan Compton a barrister, who kindly gave up his time. We received two specially written criminal cases that we had to prepare. One case was about an acid attack that occurred in the early hours of the morning at a house party where the victim, Max Addo, had acid thrown over her by the defendant Blair Forrester. The prosecution barristers were Marcus Corner and Holly Harris and the defence barristers were Rebecca Kitching and Archie Waylan. The witnesses were Paige Betty, Chelsee Wenz, Samantha Gillard and Lucy Roberts. 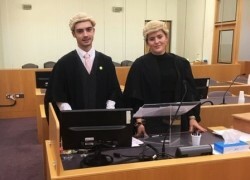 ‘Participating in the mock bar trial provided not only a strong insight to the role of a barrister, but also an insight into the functions of a judicial system. The experience of presenting my case before a court was a fascinating one, which resulted in my further determination to pursue law further’. “Participating in the competition has given me an insight into the preparation of a real case and how it is presented in court. Not only has it given me an experience of a barrister, but also the role of a working jury. The result of the trial has given me a driving passion to pursue a career in the law”. The second case was about money laundering where the prosecution had brought the case forward against the defendant, saying that Laurie Martin (the accused) was aware that her actions were illegal, however, the defence were saying that she was acting under duress. The barristers were Amy Sykes and Missie Hall who prepared both the prosecution and defence side of the case. The witnesses were Amy Castles and Jemma Grant. Other roles were the Court Clerk, Jade Saunders and the Usher was Ellie Bowerman. The following students took on the role of jury members: Tyler Hume-Reid, Amber Penn and Amy Lane. “Being part of the mock bar team has enhanced my confidence in public speaking and I thoroughly enjoyed the competition. It filled me with adrenaline which made me want to improve my skills in law and confirmed that I want to study law at degree level”. On the day the team performed exceptionally well, winning the first two rounds and missing out on a place in the final by one mark with the third round.